The Best Western Hotel Dortmund Airport is only three kilometers from Dortmund Airport and 10 km from Borussia Dortmund’s football stadium. Thanks to the good transport links, the hotel is also within easy reach of Dortmund city centre and the Westfalenhalle Exhibition Centre via the A44 / A40 motorways and the B1 road. Quietly situated in the district of Aplerbeck on the outskirts of the city, our Dortmund Airport Hotel promises you an enjoyable, stress-free stay. Guests in transit or attending conferences can also take advantage of parking in the hotel car park or in front of the hotel. In addition, the hotel has its own underground parking lot, which guests are welcome to use for a charge of 9.50 € per day. Amazing concerts and festivals are staged at Westfalenpark, only 10 km from the hotel. Our establishment is also very popular with Borussia Dortmund fans owing to its proximity to the Signal Iduna Park, the football club’s home stadium. Guests who prefer to engage in sport themselves can take advantage of the sport and leisure centre “Universum Fit-Gym” situated only a few yards from the Best Western Hotel Dortmund Airport. In addition to cardio fitness and muscle training equipment, the complex offers a wide range of recreational sports facilities, including badminton, squash and tennis. 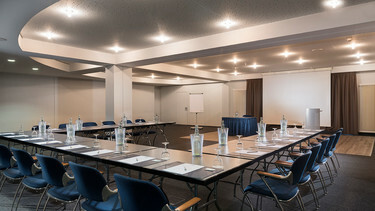 The 4-star first-class conference & business hotel in Dortmund has nine air-conditioned conference rooms with natural daylight for parties of 300 persons. The available facilities range from a small boardroom to an event hall with direct vehicle access. One of the highlights for conference delegates is the roof terrace at the Best Western Hotel Dortmund Airport – ideal for holding creative meetings and taking outdoor breaks. Our competent, personable team with an eye for detail is always on hand to offer you professional support before, during and after the event. Our hotel at Dortmund Airport has a total of 96 rooms divided into four categories. All rooms are cosy and practically furnished. The standard amenities include a flatscreen TV and free WiFi. High-speed internet is available to our hotel guests at a small extra charge. Some rooms have a separate living area adjoining the cosy bedroom. Complimentary refreshments are provided in all rooms on arrival. Our special deal for a relaxed start of your holidays. 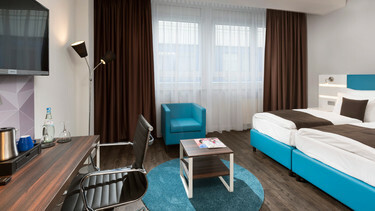 Before flying to your holiday destination, why not spend a night with us at the Best Western Hotel Dortmund Airport? After breakfast, we drive you directly to the departure terminal. And you can simply leave your car in our underground parking lot. Our hotel is popular with trade fair visitors because of its good transport links to Dortmund exhibition grounds. Major trade fairs, large-scale functions and events are staged at the grounds on a regular basis. So how about booking your hotel room for the next trade fair now?